Sister Tam Muoi : Was religion important for you, back home in Vietnam? 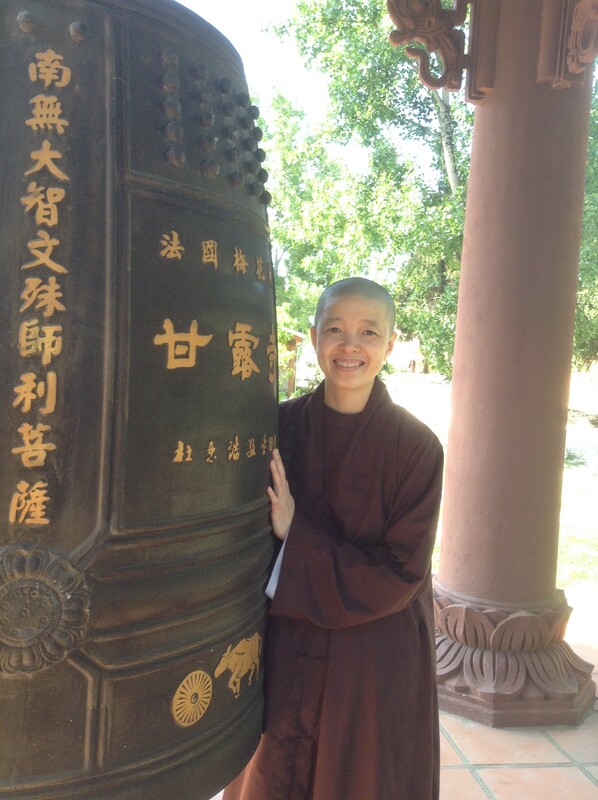 Sister Thanh Y: I was too young to have serious thought about following a religion, my mother was a Buddhist when she received the 5 precepts from venerable Thích Thiện Hòa in Saigon so I was considered a Buddhist by birth without any special transmission. TM : How did you come into contact with Thay? TY : After the fall of the Vietnamese Republic in 1975, we were forced to burn many of Thay’s books. My father was able to save a number of titles in the family basement which had served as an air raid shelter. Nẽo Vào Thiền Học, or Zen Keys was the one I remember vividly, it was amongst the first of Thay’s books that I read back then. TM : Did your family practice? TY: My Dad was re-educated in the concentration camp with the turn of the government, my Mom was always busy planning an escape from the country and she was often out of sight, there was not any formal practice in my early years. I remember the family altar with pictures of the Buddha and Avalokiteshvara and my grandmother use to light incense at night. But my aunt took a bigger step than the rest of the family. At nineteen, she came to live and work as a herbalist in a local temple and later was ordained as a nun by the Pure Land teachers there. TM : When did you meet Thay in person? And how did you feel the first time you saw Thay? TY: Thay went on the US Teaching Tour in 1997 and part of the tour was having the monastic retreat in Northern California. I was a 2 year-old nun at the time and I was very shy. The path leading to Thay’s hut passed in front of my dormitory and I saw Thay through the window. I’ve never seen anyone who walked so calmly and serenely like him. This was the first time I was in contact with mindfulness energy, embodied by a living person and not just through concepts in books. TM : How did your family react when you decided to ordain? was the way I’d like to live my life and that gave them some peace of mind on seeing that I really meant it and that it was not merely an abstract, immature thought. TM: This was in America? I was ordained 4 years after I’d come to the U.S. I had been left behind in Vietnam when I was nine years old, after many of my family’s attempts to leave the country without success. To live with the guidance of my aunty made a deep impact on my early life. She’d worked tirelessly in the herbal medicine clinic to help the poor and sick under extremely harsh and challenging conditions. I’ve borrowed a lot from her life’s intention as I continue on this path in the West. TM : What surprised you about monastic life with Thay? TY : I was struck by the youthful energy of the young monastics from Plum Village and how the mindfulness practice spoke directly to my needs. I couldn’t reach that depth of practice in my own tradition because of the way the teachings were presented to me at the time. To mentally picture the land of the Buddha with specific scenery and landscapes and to repeat the name of the Buddha twenty-four hours a day were hard because my mind was constantly distracted. With so much effort put into that practice, in addition to my many emotional upheavals, I lost touch entirely with the present moment and Thay called me back, to get in touch once again with the wonders of life. TM : What inspires you on the monastic path today ? TY : I really taste Thay’s teaching of “I have arrived, I’m home” and home is on our planet earth. I see that is the only way we can find true happiness, true freedom and we can live our live deeply. TM : Can you share a favorite story with Thay? TY : When Thay visited our sangha and was directed to his hut. Out of respect for a great zen master, we had prepared the hut with more than enough material comfort for his needs. As Thay stepped into the hut, he said : “The Buddha used to live under the foot of a tree…,” and he continued “not like this!” I was deeply moved by that comment and I had so much respect for his direct teaching. He is truly the one who walks his talk. He later advised me to go and practice in Plum Village if I wish to deepen my practice. I did that and I have stayed within this tradition since 2000. TM : What is the value of a monastic path today? TY: Thanks to Thay’s vision of introducing the monastic order to the West he has made it come alive and visible for everyone to be inspired by and the monastic path is flourishing. I am happy to help in enlarging that vision. Seeing monastics practice inspires lay friends to practice. The Order of Inter-being has become a fertile soil for many friends not only to come in touch with the teachings but also to become Buddhist dharma teachers. TM : What have you learnt about yourself? TY : I was very much aspired by sister Annabel’s practice and she has become my role model. I was so conditioned to following exactly the teachings and at times I found myself falling into the trap of performing, regardless of my own energy. The last 2 years working on the financial accounting brought up a lot of resistance in me. Nobody could find love and peace in me, but only a rigid, unhappy, yet responsible person. I don’t know how those qualities could have gone together but that’s what happened. Now I’m happy just cutting the grass! I let go of all ideas of how one should be. I place more value on the real happiness we have inside rather than on the forms we may carry on the outside. TM: How do you see the Dharma developing in the West? TY: I am confident that Buddhism in the West is now flourishing. There are many practice centers around the world practicing in various Buddhist traditions. Just driving through the cities in Northern California, one can find hundreds of Buddhist centers and temples with different Buddhist events. I can feel the vibrant sincerity in the hearts of many Buddhist practitioners. The peace and joy that they offer to the world has become our true refuge. TM : Your hopes for our Sangha? TY : I enjoy so much the Dharma talks given by our brothers and sisters since Thay has not been able to give talks himself. Each of my brothers and sisters is blooming in a very unique way and it’s wonderful to see. I feel our Sangha is even more complete and stronger without Thay’s physical presence. For me this is not a loss but a gift! TM: How would you describe our practice in one minute to someone new? TY : One minute? I would say that true freedom and true happiness can be found right in this moment. That moment is in our hand, that moment is now! Sister Tam Muoi inspires through this article, intelligence and curiousity in pursuing a path of practice. An encouraging journey for young people and all. Thank you for sharing with us. Thank you for these thoughts and stories. It gives me a sense of participating in the Sangha to know something about the monastics who have practiced with Thay.